The non-profit Women for Election has launched its first annual contribution scheme for supporters. Women for Election, which from 2012 has trained women who are interested in running for election, will use the proceeds from WfE Cousins to fund operations in 2019 as it works across the country encouraging and helping women run for the local and European elections in summer 2019. The name ‘WfE Cousins’, is in honour of Roscommon suffragette Margaret Gillespie Cousins. Wfe Cousins membership for 2019 is a one-off payment: €50 if you are working or €30 if you are unwaged, an OAP or a student. 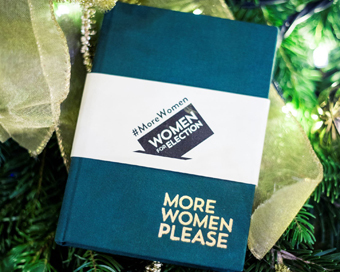 A ‘cousin’ will receive early invites to Women for Election’s free events in 2019 as well as a welcome gift of a beautiful bespoke hand bound notebook emblazoned with the demand ‘More Women Please’ in gold embossed type. The notebooks were made by Duffy Bookbinders, a family-run business in Dublin’s Five Lamps district. Women for Election are also planning a private event for WfE Cousins in summer 2019. There is also an option to purchase WfE Cousins membership as a gift for someone else. “We settled on the name Cousins because during this year, the 100 year anniversary of Irish women securing the right to vote, Margaret Gillespie Cousins’ story stood out,” explains Ciairín de Buis, Women for Election’s CEO. “She led this extraordinary life and was committed to empowering women. She herself never ran for election but her involvement in the Irish Women’s Suffrage and Local Government Association and the Irishwomen’s Franchise League with Hanna Sheehy Skeffington paved the way for many other women to pursue political life. We owe women like her.” Margaret Gillespie Cousins moved to India in 1915 where she continued her work in the area of women’s rights. Since 2012, Women for Election has trained women from all around Ireland. The organisation’s impact speaks for itself: in 2014 there was a 30% increase in the number of women who ran in the local elections compared to in 2009 and a 21% increase in the number of women elected. Of the 196 women who were elected in 2014, 50% had been trained by Women for Election. Women for Election plans to train 1,000 women before the elections next summer.